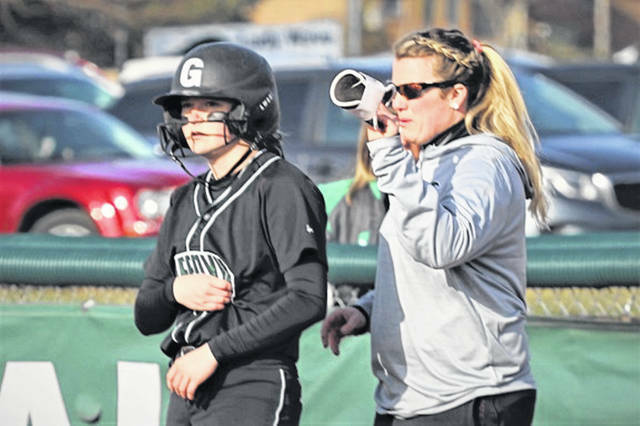 Greenville senior left fielder Lani Shilt and Lady Wave first base coach Justine Shilt talk strategy in win over Troy. TROY – The Lady Wave stayed perfect on the season with a 10-2 road game win over the Troy Lady Trojans to down the Troy on back-to-back nights. The Greenville girls got things rolling in the opening inning with Nyesha Wright knocking a 1-out single to left scoring Courtney Bryson for a 1-0 lead and made it a 2-0 score with a 2-out RBI single to center off the bat of Kennedy Fashner. Troy went down in order in the bottom of the inning with Fashner toeing the rubber for the Lady Wave. The Lady Wave took advantage of a Zoe Pressnall sacrifice bunt to score Susie Blocher and take a 3-0 lead after two innings at the plate. The Lady Trojans took advantage of Greenville error to plate a run in the bottom of the second for a 3-1 score. Greenville’s lone senior, Lani Shilt led off the top of the third with a line drive double to center and scored on Wright’s fourth homer of the new season while Troy was going down in order in its half of the inning sending the teams to the fourth inning of play with the Lady Wave up 5-1. The Lady Wave used a 1-out Blocher sacrifice fly to center to score the speedy Wright and Haleigh Mayo-Behnken to lead 7-1 with five innings in the book. Greenville upped its lead to 9-1 after six with Gilbert scoring by way of a Lady Trojans wild pitch and Bryson plating the second run of the inning on a Troy error. The Lady Trojans plated a run in the bottom of the sixth before Greenville would score the final run of the night in the top of the seventh with a RBI single off the bat of Gilbert scoring Blocher for a 10-2 GWOC Lady Wave victory. Fashner picked up the win for the Lady Wave pitching 5-innings, allowing 4-hits, 1-walk, 1-run while striking out one. Grace Shaffer pitched 2-innings giving up 2-hits, 1-walk and a run. Wright paced the Lady Wave going 2-2 with 2-walks, 3-RBIs and 3-runs scored. Gilbert went 2-2 with an RBI and a run. Blocher was 1-2 with a walk, 2-RBIs and 2-runs scored. Shilt was 1-3 with 2-walks and a run. Bryson went 2-2 with 2-runs scored. Fashner went 1-2 with a RBI and a walk. Pressnall collected a RBI and Petry accounted for a hit. The Lady Wave is scheduled to play West Clermont a 6 p.m. and Milford at 7:30 p.m. at Armco Park Friday night in Lebanon. With the win, the Lady Wave move to 6-0 on the season while Troy drops to 1-8.
https://www.dailyadvocate.com/wp-content/uploads/sites/34/2019/04/web1_SHILTS.jpgGreenville senior left fielder Lani Shilt and Lady Wave first base coach Justine Shilt talk strategy in win over Troy.